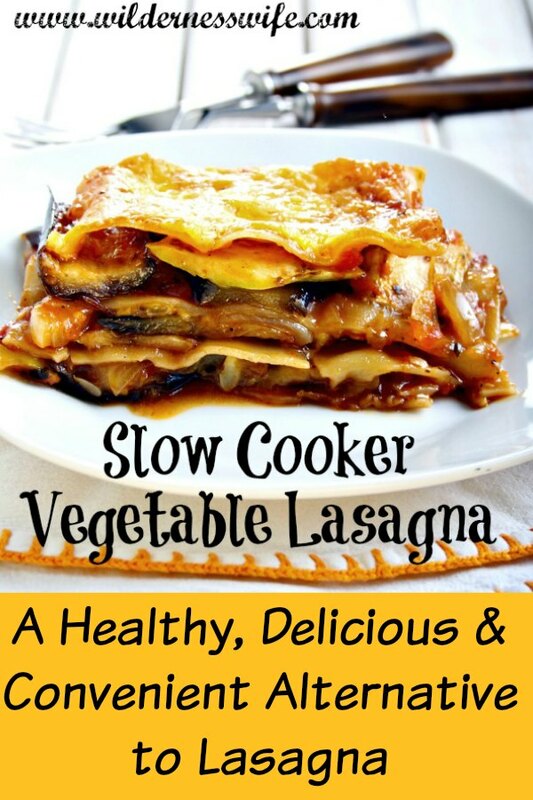 Slow Cooker Vegetable Lasagna fills your Crock-Pot with healthy goodness! Lately, I am working on some healthy alternatives to some of my old favorite foods. Lasagna has always been an ultimate comfort food for me. I was very guilty of loading it up with lots of calories and fat. But this Slow Cooker Vegetable Lasagna has all the tasty, cheesy goodness of lasagna but eliminates the usual ground beef (red meat) , sausage (processed meat), and whole milk ricotta cheese (fat). All these high calorie, high fat ingredients are replaced with healthier alternatives without a loss of the “comfort” factor, and cooking in my slow cooker makes it convenient for those busy days when I need a quick meal to serve. Vegetable Lasagna is a healthier alternative! Changing a recipe from a rich, fat laden recipe to a healthier one is just a matter of substituting comparable but healthier versions of the ingredients. In this recipe I use low fat ricotta in place of whole milk ricotta. 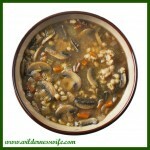 I use vegetables with a “meaty” texture like mushrooms to replace the meat. Using lots of herbs adds significant flavor to make this as tasty as the original version. Using a Slow Cooker allows you to have a hearty meal ready on the table after a busy day without having to rush, rush, rush. This Slow Cooker Vegetable Lasagna is a winner for the family that wants to improve their diet. Served with a crusty garlic bread and a fresh green salad, you have a complete meal ready to serve in under an hour. Although any fresh mushroom can be used I prefer small portabella mushrooms because of their meaty texture and their distinct flavor. But they have one drawback – the dark gills on the underside of the mushroom cap, although edible, will turn a casserole like this an unattractive gray color. I take a spoon with a sharp edge and scrape the gills away discarding them. Slow Cookers/crock-pots are great at retaining heat. Turn off the slow cooker and let the lasagna set for about an hour. This allows any excess moisture to be absorbed into the noodles. The recipe can get a little soupy if not allowed to “rest”, still delicious but not quite what you want for lasagna texture. A healthier alternative to a comfort food favorite, this Slow Cooker Vegetable Lasagna is healthy and convenient. 1/2 tsp. dried basil, if using fresh 2 tsp. 1/2 tsp. dried oregano, if using fresh 2 tsp. Spray the liner of a 6 quart slow cooker with cooking spray. In a sauté pan or skillet, heat 2 tbs. of olive oil. Saute onion, mushrooms, and zucchini for 5 minutes over medium heat. Add garlic, salt, pepper, basil, and oregano and sauté for 2 more minutes. Drain any liquid from the veggies and set aside. Mix the egg and 1/2 c. parmesan into the ricotta, blending well. Set aside. Spread 1 1/2 cups of diced tomatoes on the bottom of the slow cooker. This will help keep the noodles from sticking to the bottom of the slow cooker. Arrange a layer of noodles on top of the tomatoes. You may have to break the noodles to get them to fit. Spread one third of the ricotta mixture on top of the noodles. On top of that layer, place a layer of one third of the sautéed vegetables. The next layer is one third of the remaining diced tomatoes. Sprinkle 1/3 of the mozzarella cheese on top of the tomatoes and then repeat layering process until you place the last layer of diced tomatoes. 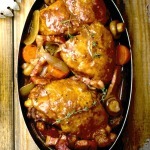 Place cover on slow cooker and cook on High for 2-3 hours or Low for 4-5 hours. Mix remaining Parmesan and remaining Mozzarella together and sprinkle on top of lasagna. Replace lid and let sit for at least one hour to let the excess liquid get soaked into the noodles and the cheese to melt.. This sounds and looks AMAZING!!! Thank you so much for sharing with us at #MMBH! I’ve pinned your recipe to our board.